This holiday season marks the 117th annual Audubon Christmas Bird Count, a favorite tradition among Vermont’s birding community. Birders in Vermont are encouraged to participate in the count, which is happening in Vermont from Dec. 15 to Jan. 2. Even novice birdwatchers can participate because every event is led by an experienced birder. Organizers and participants include birders and biologists from Audubon Vermont, the Vermont Fish & Wildlife Department (VTF&W), and many other groups. 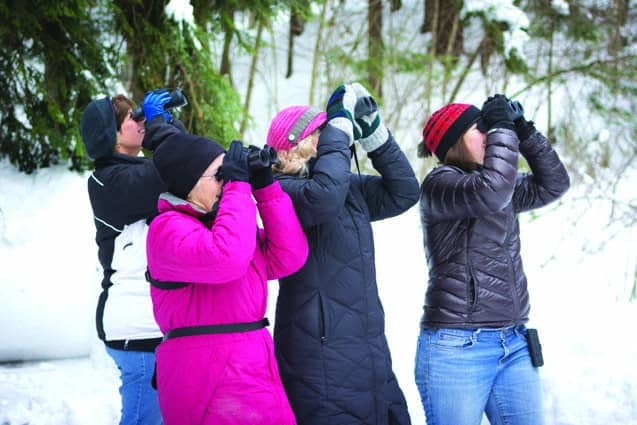 In Vermont, more than a dozen count areas and dates are available where birders gather together to conduct the Christmas Bird Count. The dates and contact information for each event are listed at vt.audubon.org/audubon-christmas-bird-count-0. The Christmas Bird Count originated in 1900 with ornithologist Frank Chapman, an officer in the Audubon Society, who updated what had been a traditional Christmas morning bird hunt to include a census of the wintering locations of various bird species. The count started with just 27 observers and has grown into one of the largest birding events in the world, with tens of thousands of people participating every year. “This is an enjoyable way to spend a winter day and it’s also a great opportunity to see different birds and learn more about them,” said Buck. A group gets a closer look at a feathered friend in the distance, a joyful past time.